Food can get you thinking. So much goes into producing it. From the seed or plant or animal itself to the time and energy and planning and muscle to feed, water, cultivate, harvest, sort, cull, transport, market, stock, promote, sell and finally get that product home in our refrigerators — and then prepared in a meal. All those valuable resources that go into producing food make me a passionate composter whenever there are peelings or leftover scraps on a plate. But I’ve got a garden, and I love the idea of plowing those resource-rich extras back into the soil. Composting is a bit of a minor miracle. It doesn’t take much work, just some time. Still, it’s not for everyone. Some people don’t garden. Others just don’t have room for a compost bin. Communities like San Francisco, Seattle and Portland, Oregon, have city-wide curbside food scrap collection programs. The food waste is recycled into soil-enriching compost. And in Connecticut, many food distributors, big supermarkets and other significant generators of food scraps are going to have to start recycling their scraps — if they aren’t already doing so — under a law going into effect at the New Year. But what about the typical household? Susannah Castle, who recently launched Blue Earth Compost, a residential food scrap pickup service in Hartford and West Hartford, says households are significant contributors of food waste to the waste stream. By some estimates, we throw out about 40 percent of the food we purchase. 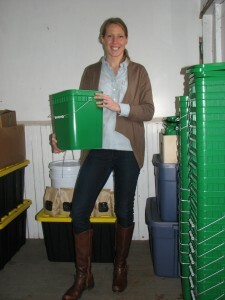 Her new, hyper-local effort will help ensure that these resource-laden food scraps don’t go to waste but instead are used to nourish the soil and enhance our ecology. Click here for my complete story.